Radha-Krishna, Radha-Krishna statues, Krishna statues, Krishna. In Hinduism and Indian mythology Krishna is worshipped as an avatar or reincarnation of the god Vishnu. Krishna is the embodiment of love and divine joy that destroys all pain and sin. Krishna is the protector of sacred utterances and cows. Krishna is a trickster and lover, an instigator of all forms of knowledge and born to establish the religion of love. He is also known for his bravery in destroying evil powers throughout his life. He is usually depicted as a young cowherd boy playing a flute or a youthful prince giving philosophical direction (as in the Bhagavad Gita). 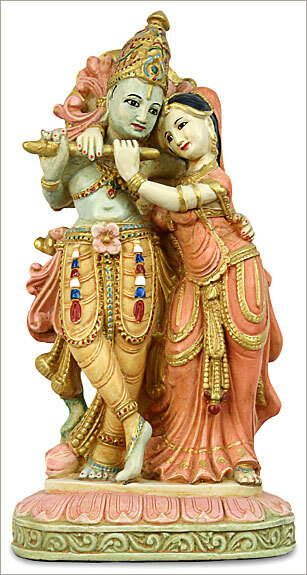 Krishna loved to play the flute and to seduce the village girls. He is shown here with Radha, his childhood devotee and lover. They are worshipped as Radha-Krishna. Radha's love for Krishna and their relationship is interpreted as the quest for union with the divine. Their relationship is the embodiment of love, passion and devotion. Krishna promised Radha that she would forever dwell in his heart and that her name would always precede his name.